Beachfront condo with amazing ocean views, shared pool, and a great location! 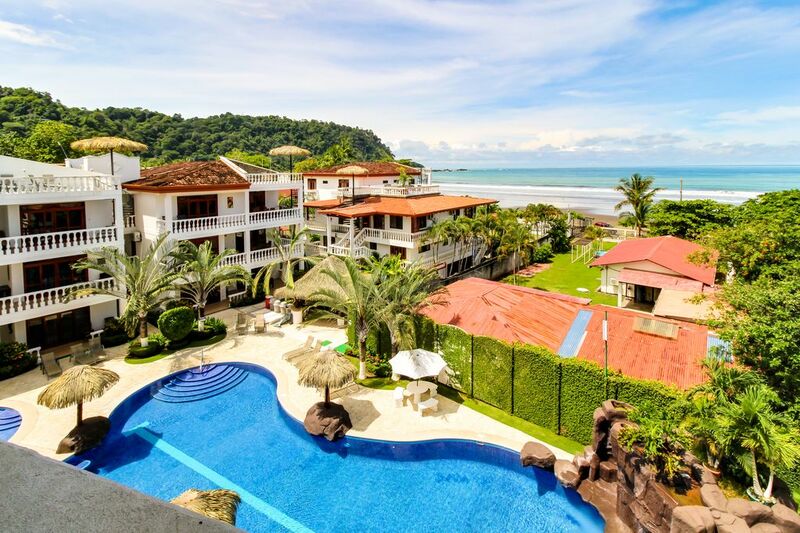 Perfect for small families and couples, this Costa Rica condo offers a great location, stunning ocean views, and a shared pool! Just two miles from Jacó's downtown, this home for six is just a short walk from the soft sands of the beach, with a shared pool and rock waterfall even closer! This upper-level condo's living room allows easy access to the great views of the balcony, a spacious sectional sofa, and WiFi and flatscreen cable TV featuring a DVD player for entertainment. Whether you eat indoors at the breakfast bar for three or outdoors on the balcony, the kitchen is fully equipped for making delicious meals, with stainless steel appliances and a dishwasher for easy cleanup. Six lucky guests (four adults maximum, please) can enjoy this home's two bedrooms and two bathrooms. The master bedroom boasts a luxurious king-size bed, while the second bedroom offers two twin beds. Each bathroom has immaculate tile work and beautiful mosaics in the walk-in showers. This home also has a private washer and dryer and a sofabed for your convenience. There's plenty to do nearby, from the beach's soft sands and gentle surf to the shard pool, but don't miss out on Jacó's boating, kayaking, and fishing opportunities! If you tire of watching the boats bob in the marina or catching your tee time at the golf course, you're just 13 miles south of Carara National Park, and 60 miles from the capitol of San José. Place your reservation today and get ready for an unforgettable Costa Rican getaway! Parking Notes: Parking is very limited at La Paloma Blanca and is on a first come first serve bases within the complex. With this said there is parking on the street and guards can watch the vehicle. Water Access: Paloma Blanca is an ocean front property. Simply walk past the pool, through the back gate to access the beach. This was an incredibly relaxing and fun place to stay. The condo had everything you could ask for with a great view of the ocean. The pool and grounds were beautiful with a great staff. The beach was steps away. We would definitely come back here again! The condo was beautiful. We’ve stayed in several condos in La Paloma Blanca. They are all nice but this one was decorated very tropical with nice bright paint and pictures on the walls. We loved everything , amazing view, the pool, beautiful plants around the area, gardeners always working on the garden, security people always keeping a eye on everything..All appliances in the kitchen working perfectly. We enjoyed our stay at Paloma Blanca B4..
We loved the sunset view, access to the beach, pools, and friendly very helpful staff!! The beds were comfortable!! Close to the Jaco main drag but far enough away to have peace and quiet. Loved listening to the waves each night. It was amazing!! !